Thank you for your support of my recent trip to the US/Mexico border. You have been kind and generous beyond measure, and I am grateful. In addition to the $500 donation made by our Congregational leadership, and the $1000 previously contributed by our own Community leadership, you raised $1, 170! I personally delivered a check for this amount to Annunciation House, one of the main immigrant resettlement organizations in El Paso. On behalf of all the people you have helped in this way, I thank you. As you know, I’ve just returned from this immersion experience, which was sponsored by the Mercy Sisters. While there, I learned about the plight of people newly arrived at the US border from the Central American countries of Honduras, Guatemala, El Salvador and from Mexico. In all of these countries, violence is part of daily life and gangs, government and police work together to crush dissent. I heard many stories of individuals and families fleeing for their lives, threatened just for being related to someone who publically defied the rampant corruption of those in power. One morning we walked across the bridge that connects El Paso, TX and Juarez, MX, the same bridge where refugees wait, many wishing to ask for asylum in the US, many believing they will be accepted into the ‘land of plenty” once their story is heard. Statistics show the majority are mistaken: only 2 out of 100 are granted asylum by the El Paso courts while in detention, and 6 out of 100 when released outside of detention. Refugees presenting themselves at the Port of Entry are kept in a holding cell while being “processed”. Until recently changed by court order, the number of days a person could be held in this way was unlimited. We heard stories that up to 40 people were packed into a room with one toilet, no shower or sink, and one meal provided per day. One man explained his technique of sleeping upright against a wall because there was no room left to lay down on the floor. As I was serving dinner at a resettlement house one evening, I met a 10 year old girl just returned from the hospital, diagnosed with diabetes. The House Director expressed relief that the girl began showing signs of illness after she and her mother were released from the holding cell, otherwise she may not have received the needed medical care. 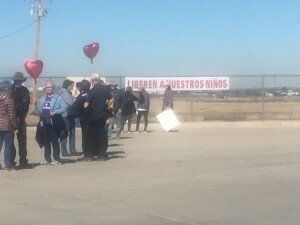 Ruben Garcia, Director of Annunciation House in El Paso, oversees the placement of the immigrants in shelters after ICE releases them from the holding cell. Wondrously, he maintains an attitude of compassion toward all those caught in this system, including Border Patrol and ICE agents, while at the same time aiding immigrants released onto the streets. These people, including children, have no food, money or arranged shelter. Most are unsure of their final disposition. They will be assigned court dates at which it will be determined whether they will be granted asylum or deported. If they have relatives or friends in the US who will sponsor them, shelter volunteers make calls to arrange for transportation, pack lunches and drive them to the airport or bus terminal. If they have no sponsor they will be kept in detention at a cost of $135.00 per day. Many request to be voluntarily deported after futile attempts to plead their case. Most immigrants speak Spanish but some are Indigenous People who speak dialect, have never traveled by plane and have difficulty finding their way through our airport systems. All those traveling wear ankle bracelets so their whereabouts can be monitored. During a visit to Juarez, a city of 1,512,354, we saw dire poverty in the neighborhoods: dirt roads, houses that appear patched together and fences made from old box springs, hungry dogs scavenging in the streets, beautiful children begging. Knowing that poverty exists in every city of the world did not lessen the impact of these scenes. 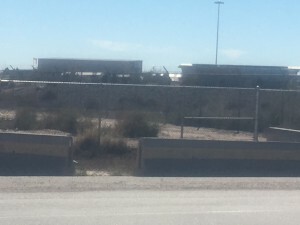 Some of the homes lie just across a barren road from the border wall which separates Juarez from El Paso. Our group had the freedom to walk on both sides of that wall. Folks in the Juarez neighborhood can only look through the wall’s iron slats in one direction: toward the city of El Paso with its functional highways and beautiful architecture. Walking along the wall brought the realization home to me that borders are human inventions, arbitrarily designating who is considered “in” and who must stay “out”. The wild creatures of the area are also excluded, deprived of the freedom to roam their natural habitat. Only the birds have free access to both sides of the wall. The City of Tornillo is located about 45 minutes from El Paso, in an area of desert and small towns. This is where a tent city has been erected, capable of housing 3,800 children, mostly adolescents, who have been designated “unaccompanied” and separated from their families. It is a stark and surreal picture: a sea of beige structures surrounded by fencing and topped by barbed wire. Guards are stationed at the entrances and exits. Our group joined an interfaith vigil of about 90 people outside of the camp. We saw signs imploring mercy for the children. One large banner read “Free our Children Now”. The message of compassion we attempted to convey is that these children are “our children” too. The US is detaining them at a cost of $775 a day per child. Yes, they have the necessary food, clothing, etc. but this is a sterile environment. They are not free to leave or see their families. Their emotional and spiritual needs are certainly not being met. This is an artificial city of potentially traumatized children. The plight of immigrants is real and complex. We spoke with Border Control agents convinced their enforcement is necessary, and resettlement workers, caring volunteers, dedicated religious and clergy all working to support the immigrants through a confusing tangle of administrative and court-related requirements. Most important, we saw the immigrants themselves. Shy smiles came from adults and children in response to the few Spanish words I offered. Many looked lost and frightened. A resettlement volunteer who is spending a year helping out at Annunciation House told us that in every encounter with an immigrant she attempts to offer the warm welcome they did not receive during their period of processing and detainment. She wants to convey the message “we want you here”. I can only imagine that initial experience of rejection being in very harsh contrast to the immigrant’s often simple expectation of finding a better life in the US. People arrive at the US border from countries made poor and violent with the “help” of US interference in democratic elections (as is the case in Honduras) and of US corporations that extract wealth from the land, devastate the country’s economy, and employ locals at non-subsistence wages. In Mexico, a factory worker makes an average wage of $52.00 a week. What is currently happening at the border reflects the unbelievably strange situation of the very country that harmed people now being unwilling to help them. We were told by an immigration attorney that it can take up to 35 years to immigrate legally into the US, and that the asylum law was not written for today’s circumstances. There is so much to understand about the situation we now face at our US border. But the underlying questions rest on our experience of compassion. Do we Americans have enough compassion to “welcome the stranger” as Jesus taught? What needs to change in our lives to enable us to offer compassion more clearly, more concretely? Are we willing to sacrifice some of what we have and enjoy so that others might have something? Immigrants arrive at shelters with only the clothing they’re wearing. Nothing else. Can we even imagine being in that situation? If I look in my own closet, what will I find there? I came away from this experience asking myself questions about fairness, compassion and the bonds of our human connection, about the ways I’m complicit in a culture that oppresses others and about the ways I need to grow spiritually. I find myself praying that this time at the border will have lasting impact on my awareness and impel me to increased action on behalf of those oppressed.